Follow the base recipe making the macarons. Add some concentrated yellow food coloring to the mixture, while beating the egg whites. 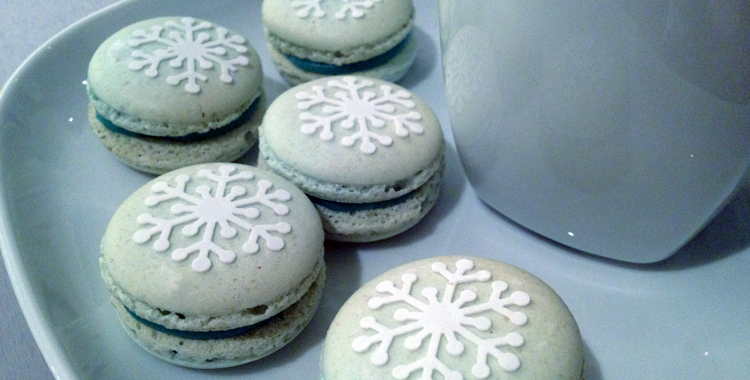 Bake and cool the macarons. Scale the pineapple and make puree out of it by using a mixer. (If you can’t get hold of fresh pineapple, use canned pineapple or pineapple juice, but remember that you will loose the really fresh flavor.) Chop the mint leaves. Measure up 1/2 dl (1/4 cup) of pineapple puree. Combine chocolate and puree in a small pan. Heat the mixture on low heat until the chocolate has melted. Remove the pan from the heat and add chopped mint leaves. Mix together and leave to cool. When the ganache has thickened (after some time in the fridge), you can start sandwich the macarons. Use a teaspoon, a knife or a piping bag, whichever you prefer: turn a macaron upside down, add 1/2-1 teaspoon of chocolate ganache, and press the bottom of another macaron on top of it. Place the macarons on a serving platter, serve them and enjoy! Tip! Do you have leftovers of mint and pineapple? Marinate pineapple cubes in pineapple juice and chopped mint leaves for a couple of hours. An easy, healthy dessert!